Excerpts from a few of the many feedback received post Events. This is whats makes us perfect, especially when it is from you - Truly Priceless !! I received a lot of praise for Willis from my new family and old. He kept the crowd entertained, especially at the time I went to change into my saree from the gown. He had covered all the necessary information prior to the wedding so as to not miss anything. The whole event was well planned and exceeded my requirement and all details were covered adequately. He met all timelines and was punctual. He knew what the audience expected and delivered with relevance and wit. Willis is gentlemanly and well mannered. "Willis was not just an emcee but a pillar of strength for us on our wedding day. He was meticulous with his preparation and used his calm demeanour and wonderfully warm personality to ensure the two of us and all our guests had an evening to remember. In Willis' hands, we didn't have to worry about a thing. He's a great guy." Our wedding reception was adequately planned by Willis. He covered all details of the Event. He exceeded our expectaions with his timing and commitment. His connect with the guests was excellent as he knew what they expected and delivered. He was gentlemanly and well-mannered, while being quick witted and relevant. Willis, you did an excellent job !! Willis' planning exceeded our requirement. He covered all the details of the wedding adequately and he was punctual at all times. He knew what the audience expected and he connected and delivered very well. He was very quick witted with relevant humour. Willis was gentlemanly, pleasing and well mannered. The otherwise plain ceremony was brought to life by his wit, gags and presentation of the matter. The whole event was organized and conducted very well. He kept all of us entertained and ensured we all had fun. Most of the people enjoyed the dance as well. ﻿Willis was the perfect MC for our wedding. He has a cheerful persona, a positive attitude, is punctual, and very responsive (which was very important to us). Before the event, he met up with us a couple of times and gave us some pointers and suggestions to make the celebration more fun. Despite a few hiccups(as with any wedding), he made sure that we kept smiling, and entertained everyone with his commentary. He was also in constant communication with the DJ throughout the night to ensure that the party didn't stop. He got rave reviews from everyone including the Americans that attended. Willis planned very well for our Wedding. He has a good eye for detail and as such he covered all details of the event well. He met all timelines and was punctual. He was excellent with the audience and knew what they expected and delivered accordingly. We must add that he was very quick witted and also relevant !! Right through, he was gentlemanly and well mannered. We feel you managed the crowd really well. You also managed the time with fillers and jokes when there was a delay. Your reminder that we should keep smiling helped us and the video and photographs have come out well even though things didn't go as we had planned. People really enjoyed themselves and found you to be warm and fun-filled. The Grand March was really lovely. Thanks once again, for being available and making a difference to one of the most important days of our lives. With immense joy and gratitude, we, the Management, staff and students of Mariam Nilaya High School, want to thank you for your inspiration, help and support in organising the "Marian Fest 2012". Being a maiden venture, we were guided by your expertise right from the start. You rightly told us that this was the first fete you organised within a week! Despite being the Christmas season, you spared your precious time and took care of all the arrangements. Congratulations, dear Mr. Willis ! 'Marian Fest 2012' was a day of relaxation and enjoyment for the parents, children and all of us because you, as the Master of Ceremony kept us entertained from 9:30am to 5:30pm. God has, surely, blessed you with rare qualities! May you continue to serve the needy through your generous giving of yourself, without counting the cost! May God bless you and your family, is our prayer for you. Sr. RoseMary, Headmistress, Mariam Nilaya High School. ﻿Thank you for making yourself available for the two-day VINPAL FUNFAIR 2013 held at our Church campus on January 26th and 27th. As a member of the Organizing Committee your presence with us all through the planning stages, right up to the last event of the Funfair, was invaluable. I am very appreciative of your sense of commitment and dedication seen in the meticulous planning of the event, and the coordination of the various sub-committees and their given responsibilities. As Master of Ceremonies you were simply amazing from start to finish! With your pleasant voice and excellent people’s skills, you easily drew people in. You have a way of livening up the atmosphere and keeping the crowds interested in the happenings and events of each day. I don’t know how you do it and where you get the energy from, but you kept us all going. I also recall your energetic presence with us last year, at the VINPAL Funfair 2012, held in January of 2012. Thank you Willis for your valuable contribution to this event! You have been truly blessed with exceptional skills, a generous spirit and boundless energy. We were blessed to have you with us at both the events. We would be very happy to have you with us every year, at this Annual Funfair, organized at St. Vincent Pallotti Church, Banaswadi. You were completely professional & helpful. Miriam and I were truly awed by the Montage. It .was done so well and so fast. We liked the decorations and the extra flex backgrounds that you provided. The banner was extremely well done! We liked that everything was ready well in advance. We didn't need to run around and get things done. After giving it to you & Reann, we just relaxed and went with the flow. We are deeply grateful to you both and will refer you to as many people as possible ! 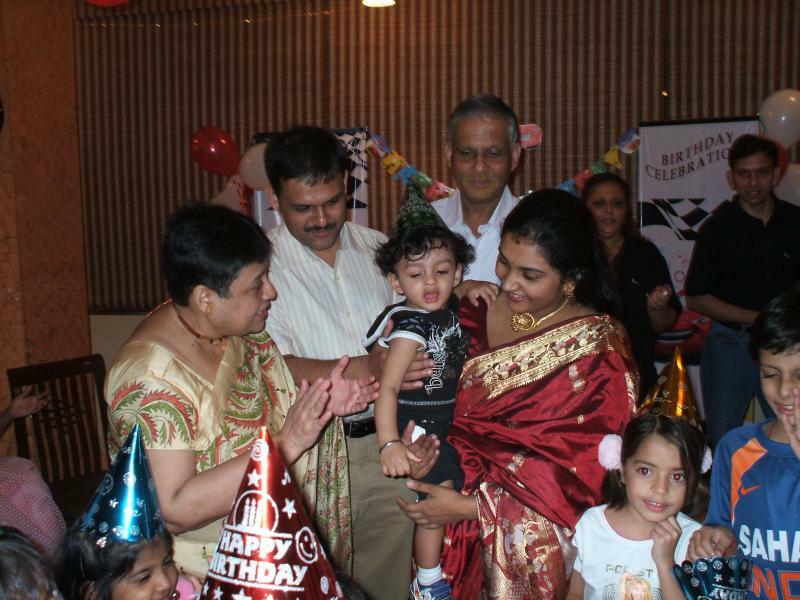 This is to acknowledge your kind services and let you know our deepest appreciation of the great work done by you for our son's birthday celebration. Amrita and myself will like you to know- that we were very pleased with the plan and execution thereof of the entire party. The spotligtz team was very professional right from the planning stage till the end of the party. We liked the way you planned keeping all our requests in mind and also helping us with valuable suggestions. We were amazed by quick way- you set up everything. We were very glad to see everybody of our invitee very happy and participating in innovative games you played for them. All in all a five star treatment and that too- at great value for money. Thanks and best regards from Sengupta family. Fabulous Work! Well Done! My wife, my family, my friends and especially the little ones had an excellent time during my second son's first birthday. Every bit of the party time was cherished as much as we do it even now. The whole party was well planned and executed right from the beginning to end. I am very happy to see that your team had carefully executed every nitty gritty of the party with impeccable timing. There was never a time in the party that I had to worry that my little guests were not entertained. Kids are quintessential in such parties and the reason most of the people turn up in such parties is for their kids. When kids have a gala time, then the parents and the other family members get an added opportunity to intermingle and spend more time with other guests. They also feel happy at the end of the day that their kids had a great time. I got such wonderful feedback from many a parent after they attended my son's birthday. Being a host, this was one of the parties which I enjoyed very much, without having to worry about any of the arrangements before and during the party. Your team just took care of it! Thanks so much and we wish your team a great success! Just email willis@willislangford.com for a quick booking, if you wish to be a satisfied Client as well and get a value-filled offer!